I use notebooks to journal, to stay organized, to sketch…but I also love dividers. I love being able to put them where I want them. So much better than your categories being built around the way the notebook is. Choice is key. & check out these fancy ones from See Jane Work! So colorful. We all make misteaks mistakes. I don’t use pencil all that often, but when I do – I always need an eraser by my side. & I like using one that isn’t on the end of the pencil – those are rarely up to the job. 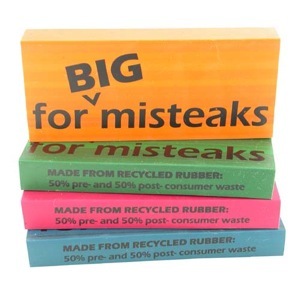 I also like that these erasers let you know that even they have made a mistake. 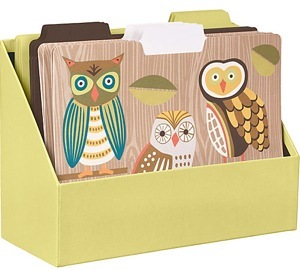 Cute file folders are great! File folders aren’t for everyone, but if you’re looking at some – you might as well make them something you get a kick out of. These ones from Paper Source are pretty aesthetically pleasing. I use plain manilla (partly because I like the word manilla) but I might be tempted for the map pattern at some point. Any good ones out there you’ve been ogling? i totally hear ya about the love affair with manilla. oh…you didn’t say love. i did? cute little owls. map patterns sound fun. last time i was in my office supply store i left with an arm-full of used books. i should have been there to replace my broken wheeled file cabinet.whoos…..but at least now i have my favorite v.c. andrews and jerzey kosinski books. Really big post-it notes in tropical colours, so you have the luxury of spreading your memo out. I’m with Kelly on the fancy postage stamps. The Canada Post employees roll their eyes when I ask to look at their latest “pretty stamps” .